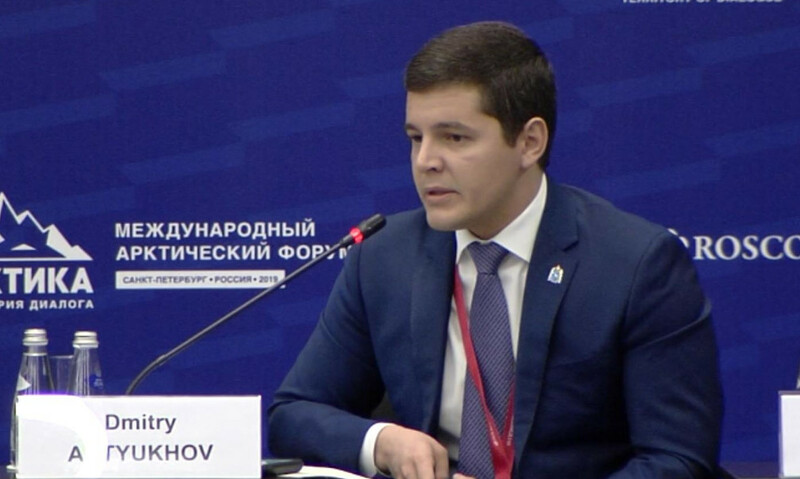 Within the forum “Arctic — Territory of Dialogue” the governor of Yamal-Nenets Autonomous Okrug Dmitry Artyukhov spoke about why the country needed the Northern Latitudinal Railway-2, and at what was the today’s stage of implementation of this project. He notes that extraction is now moving to the North. It requires using new technologies, decrease in cost and increase in “production comfort” in development. The governor reminded that the high level of production, clarity of timing and funding allowed introducing the giant “Yamal LNG”. And he has no doubt that the second project of NOVATEK will be implemented flawlessly as well. According to the governor, there is “a classic set of benefits”, including tax ones, for such projects. “We are ready for new solutions, we are discussing the investment tax deduction”, the head of the region said. Dmitry Artyukhov explains that to implement the project it is necessary to bring the railroad line to Sabetta from Bovanenkovskoye field, where it now ends. “Our task is to lead it to the central port of the Russian Arctic”, he said. The head of the region outlined the scheme of further actions: all key participants — Gazprom, NOVATEK, Russian Railways and the government of the region — must sign the agreement on intent. Next, 4 new vessels will be required for transportation of stable gas condensate from Sabetta. The next task is in the concession agreement, which will clearly spell out the obligations of all the sides. “Then we shall be able to implement this project on economic principles without budget financing. It means saving at future development of the entire central Arctic. And safe and reliable infrastructure in the Arctic is the basic thesis”, Dmitry Artyukhov explained.